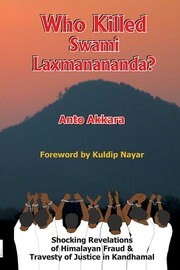 1 edition of Who killed Swami Laxmanananda? found in the catalog. Add another edition? Are you sure you want to remove Who killed Swami Laxmanananda? from your list? Published 2016 by Veritas India Books in Bangalore . Thus spake Swami Laxmanananda Saraswati in an interview featured in a documentary titled ‘The Agony of Kandhamal’. However, he added, “God has sent me from Himalaya and it was stalled. That is why their campaign was to drive away swamiji and create a Christian land. As long as I am alive I shall not let you do that." This boastful claim seemed to have been capitalized upon by vested interests. The swami along with four others were mysteriously murdered on the night of Janmashtami in August 2008. Since the swami had named even the Pope and Sonia Gandhi as people who considered him a threat to the Christianization of Kandhamal, it was easy to spread the rumour that Christians had killed him. Given the hostility between Christians and the swami who used to carry out regular reconversion ('ghar wapsi') ceremonies during his rath yatras across Kandhamal, the Christian baiters knew they had a golden opportunity to demonise the community. The fact that he was assassinated on Janmashtami night leads to the conclusion that the forces behind the swami's murder had envisaged the subsequent collateral damage. Nearly 100 Christians killed, 300 churches and 6,000 houses looted and plundered in unabated violence. That would explain the rationale behind the zigzag funeral procession crisscrossing Kandhamal for two days. The orchestrated propaganda the 'India Foundation' carried out to foist conspiracies about Kandhamal across the world abusing the name of the nation itself leads to the logical question: if the Christians had conspired to kill the swami why should the top Sangh Parivar leadership risk their reputation to enact a fraud of Himalayan proportion? The 'India Foundation' and the 'The Agony of Kandhamal' documentary it brought out have blown the lid off the Kandhamal fraud. The travesty of justice - illustrated in-depth in Part II of this work - the black out and stoic silence of even the National Human Rights Commission on Kandhamal - all point the needle of suspicion in one direction only. Yet, seven innocent Christians continue to languish in jail, convicted to life imprisonment for a crime they never committed. December 16, 2017 Edited by Todays Martyrs Reviewer Edited without comment.